America is a land of pioneers. American inventors were first in flight, American scientists were first on the moon. Americans created baseball, jazz, Disney World, and the lightbulb. Our country is defined by progress. Progress is part of our past, but also essential to our present and future. There are opportunities in every industry and facet of American life for improvement. Applying standards may sound like additional hoops to jump through, but in the long run, the benefits are worth the extra work and attention. Materials are used much more efficiently when stretch wrap is applied consistently and correctly. Costs are cut, and the risk of load failure is virtually eliminated. In the US, packaging experts have to be innovative. Without the government setting a standard, we are left to come up with a way to set and hold standards within the industry. We have to be self-accountable and self-reliant – the values we pride so much as a country that American philosophers like Ralph Waldo Emerson wrote whole books about them. The most efficient way to diagnose problems and create standards is by applying the scientific method. The purpose of the scientific method is to investigate, acquire knowledge, and correct and integrate existing knowledge. Atlantic’s MUST Method is an industry-specific version of the scientific method. Our approach to audit, test, optimize, and monitor is our scientific method. We’re using these steps to find solutions to problems, develop general standards based off of solutions, and to set and hold these standards, continually repeating and refining the process until we reach the right solution in each individual case. After Atlantic technicians perform machine and film wrap audits in a facility, they combine all the data they’ve collected, synthesize it, and calculate the best solution (See: Learn to Love the Audit). This sounds simple and logical, but it is a leap ahead of current problem-solving methods for some stretch wrapping operations. A common problem-solving method in the packaging industry is blind trial and error. But trial and error is the most inefficient way to solve a problem, and it does nothing to reduce cost or risk of load failure. It’s like smacking the TV when the signal goes fuzzy – it rarely works, and you usually end up having to call the cable guy anyway. 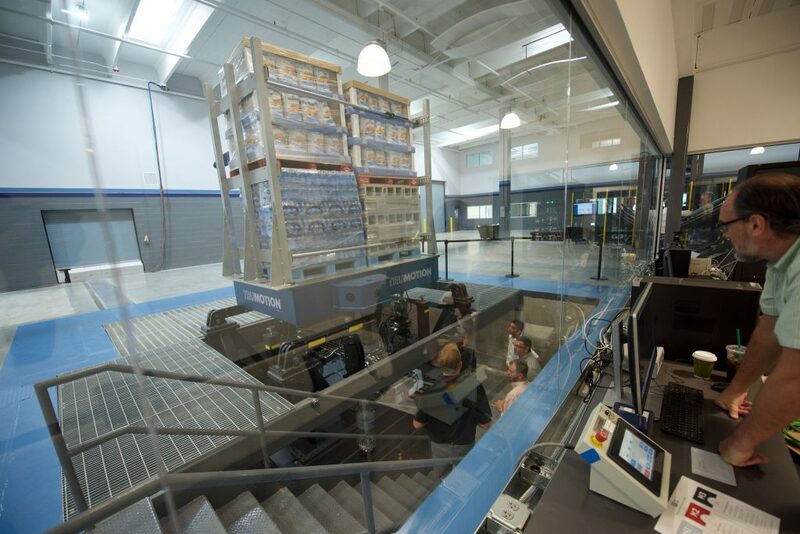 In Atlantic’s scientific MUST Method, solutions are tested in real world simulators at our Packaging Solution Center in Charlotte, NC. Engineers test solutions by using data collected in the audit to recreate conditions and simulate the effects of a proposed solution. With this process, a customer can be certain that a solution will work – they don’t have to take anyone’s word for it, they can see it working in a live demonstration. With proper testing, incremental per-load savings can add up to considerable cost and damage reduction for a company. If a solution isn’t working as planned, film, pre-wrap, wrap patterns, and stretch settings are calibrated and tested again, in a process that continues until a solution is found that eliminates load failure. What makes testing so important is that assumptions and generalized solutions don’t work in packaging. Every type of load reacts differently, based on what’s in the box, what’s on the pallet, and where the load is going. As a result of this process, the MUST Method establishes standards for individual machines and loads. Testing and setting these standards is the first step towards consistency in the packaging industry. It is possible to eliminate risk, and to minimize cost with certainty. It just takes a commitment to innovation, and self-accountability.